Analogue gain can be adjusted from +24 to -21dB in 0.5dB steps, while digital gain can be programmed from -21.5dB to -103dB in 0.5dB steps. 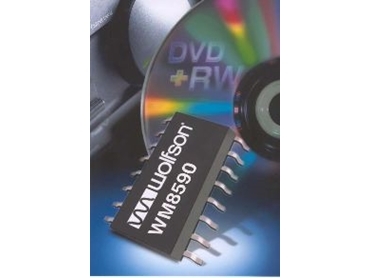 WOLFSON Microelectronics has released the WS590 audio codec for DVD-RW systems. It has differential stereo inputs and outputs and its sample rates are independently programmable for the ADC and DAC. It delivers audio performance suitable for home DVD-RW, consumer surround-sound entertainment and other audiovisual applications. The codec has a 24-bit sigma-delta ADC with programmable input gain and limiter control. Analogue gain can be adjusted from +24 to -21dB in 0.5dB steps, while digital gain can be programmed from -21.5dB to -103dB in 0.5dB steps. Output word lengths from 16 to 32 bits are supported, along with sampling rates from 32kHz to 96kHz. The result is a ADC signal-to-noise ratio of 102dB, while the DAC side of the codec provides 110dB SNR performance and sampling rates from 32kHz to 192kHz. The device's audio data interface supports IIS, left-justified, right-justified and DSP formats. An SPI-compatible, three-wire control interface allows software access to all the codec's features including volume control, muting and de-emphasis. The WM8590 is packaged in a small-outline 28-pin SSOP.